Before the close of the 2017-18 school year, the Western Suffolk BOCES School Library System held its third annual Leadership & Information Symposium at which it honored library media specialists who contribute so much to their school districts throughout the year and to celebrate the successes of the System’s membership. Two people were selected to receive Librarian of the Year awards: Joan Hanley of the Commack School District and Alice A. Robinson of West Babylon School District. The Administrator of the Year Award was presented to Rudy Massimo, Principal of R.J.O. Intermediate School in the Kings Park School District. The day also acknowledged all of the retirees from six different districts. 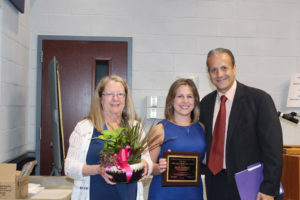 Sara Kardasz, Program Administrator, School Library System (left) congratulates Rudy Massimo, Principal of RJO Intermediate School in Kings Park (right) on his Administrator of the Year award, along with Deanna Jakubowsky, School Library Media Specialist. 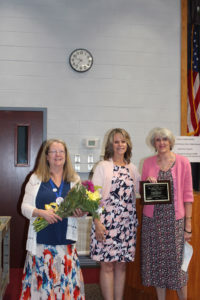 From left: Sara Kardasz, Program Administrator, School Library System, and Carolyn Burton, School Library System Council member, congratulate Joan Hanley, Commack SD. who received a School Library System Librarian of the Year award. 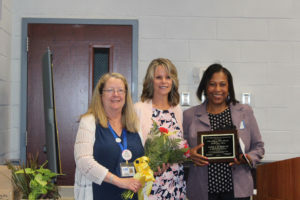 From left: Sara Kardasz, Program Administrator, School Library System and Carolyn Burton, School Library System Council member, congratulate Alice Robinson, West Babylon SD. who was honored as a School Library System Librarian of the Year. 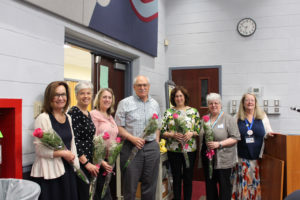 School library media specialists retirees were congratulated on their retirement: (from left), Maryellen DiCioccio, Linda Lennon, Laura Irace, Stuart Horowitz, Louise Prescott and Linda Dickman.